Wildlife are curious. If you sit on the ground and keep quiet, chances are that a 'gang' of King penguins will come for a closer look, or a Heard island cormorant may mistake your shoe laces for a worm! In December 1947, Australia established a research station at the north-western end of Heard Island, at Atlas Cove. The station was originally planned for Spit Bay at the eastern end of the island, but poor weather prevented landing operations there. During the nine years that the station was operated, ninety-one expeditioners wintered on the island. They studied the island's animals, plants and rocks, the region's weather and atmosphere, and they mapped the island. The station was closed down on 9 March 1955, following the establishment of Mawson on the Antarctic continent in 1954. The next Australian scientific visit was for six weeks in the first three months of 1963. During this visit, a number of scientists and a small climbing party were landed on the island. Poor weather prevented the climbers from reaching the summit of Big Ben, the 2750 metre high glacier-covered active volcano that dominates the island. In 1979/80, a National Mapping expedition visited Heard Island for little more than two weeks. During this visit, the second landing was made on McDonald Island, this time by amphibious vehicle (the first landing having been a brief visit made by helicopter during a joint French-Australian expedition in 1971). A small team was present on the island for five days conducting the first scientific surveys of the island. Between 1985/86 and 1987/88, three extended visits were made to Heard Island for the three summers, with the 1987/88 expedition present on the island for five months. A short month-long mid-winter visit was made in 1990 by a team of four at Spit Bay. Five expeditioners wintered on Heard Island between January 1992 and March 1993. 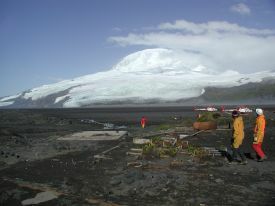 Further expeditions were present on the island in 2000/01 (42 expeditioners) and 2003/04 (28 expeditioners). Current intentions are for the Australian Antarctic Division to support further Australian Antarctic program summer visits to the region approximately every three years over the next decade to undertake research, monitoring, and any required on-site management activities. During the summer of 2003–04 the AAD conducted a scientific expedition to Heard Island. The party of 28 scientists and support staff spent two months on the island undertaking a range of programs including animal, bird and terrestrial biology and glaciology. Biologists who wished to satellite track albatrosses, penguins and seals to determine their foraging areas. Dive recorders provided information on the activity of these top predators and the use of their foraging space. The diet of the predators was studied with traditional and new molecular techniques to determine what they had been eating whilst at sea. At the same time that the animals are foraging, the Aurora Australis conducted a series of oceanographic projects, including trawling in the areas utilised by the predators, to better understand the characteristics of the predators’ prey. studying the impact of climate change as part of a major international project called RiSCC (Regional Sensitivities to Climate Change). Heard Island is a major research site along the Antarctic Environmental Gradient ( AEG). The AEG spans 30 degrees of latitude and includes a range of macro-climatic zones from cool temperate islands to the frigid and arid Antarctic continent. hoped to conduct simultaneous studies on Heard Island and the Kerguelen Islands during the 2003–04 summer. These studies focused particularly on documenting variation between the islands in important environmental parameters, such as temperature, and the effect these parameters have on fundamental attributes such as life cycles, phenology and growth of terrestrial organisms. Glaciologists continued studying the Brown Glacier. Detailed surveys of the glacier's snout and surface would determine if glacial retreat is rapid or punctuated. 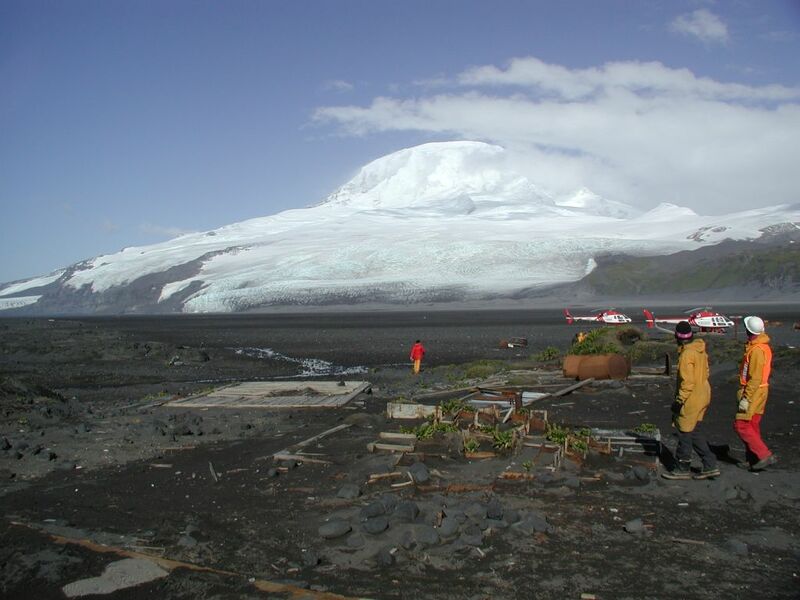 Measurements on the mass balance of the glacier, as well as more detailed ice thickness measurements using a portable radar echo sounder, were undertaken. Monitoring of climatic conditions continued, with an emphasis on the impact of Foehn winds on glacier mass balance. Repairs were made to an automatic weather station established in November 2000.